Osteoporosis (or porous bone) is a disease in which bones become weak and are more likely to break. Without prevention or treatment, osteoporosis can progress without pain or symptoms until a bone breaks (fractures). Fractures commonly occur in the hip, spine, and wrist. Although women are more likely to get osteoporosis, it is not just a disease of elderly women. Osteoporosis is more common in white or Asian women older than 50 years of age, but osteoporosis can occur in almost any person at any age. Many people who have osteoporosis and risk factors for osteoporosis often do not know they have thin or weak bones. This is because most patients with osteoporosis have no symptoms and are not aware of their weak bones until they have an unexpected fracture. For example, a simple everyday movement such as picking up a grocery bag causes a broken bone or a slip and fall in a parking lot causes a broken hip, and that is their first "symptom of osteoporosis." Osteoporosis is often not recognized in men. There are many reasons for underdiagnosis in men. Identifying risk factors is important because osteoporosis and fractures can be prevented and treated. Also, men have a higher mortality rate due to hip, vertebral, and other major fractures. Osteoporosis is more commonly diagnosed in women, and women are at greater risk than men. Men have larger bones than women. This means that men have larger reserves of bone mass to draw from as they age, so their bone loss progresses more slowly. Also, men do not experience the same rapid bone loss that occurs in women during and after menopause. Because bone loss is delayed and osteoporosis does not have any symptoms, men do not usually know they have osteoporosis until a fracture occurs. Increasing awareness about the true frequency of osteoporosis in men is essential for prevention and long-term health. Osteoporosis is diagnosed using bone mineral density (BMD) tests to measure the solidness and mass (bone density) usually in the spine, hip, and/or wrist (the most common sites of fractures due to osteoporosis). These tests are performed like X-rays, and they are the only reliable way to determine loss of bone mass. They are painless, noninvasive, and safe. The results of a bone mineral density test are compared to standards, determined from the general population. One of the problems with measuring the bone mineral density of men is that many of the standards used for comparison are from young women rather than men. The average bone mass in healthy young women is always lower than that observed in healthy young men. This means that a man may have low bone mass (osteopenia) compared to healthy men, but the comparison with the norm (from young women) will not show that they are at risk for osteoporosis. Consequently, few men are classified as osteoporotic based on the normal data from young women. Even though bone loss in men usually occurs later in life compared with women, men can still be at high risk for osteoporosis. By age 65, men catch up to women and lose bone mass at the same rate. It is estimated that by 2025, the total number of hip fractures in men will be similar to the current number reported in women. Perhaps because men are generally older than women are when they have a fracture, men are often more severely disabled. 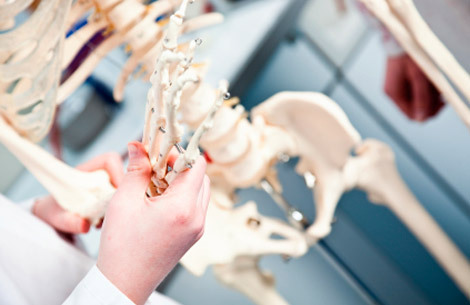 As with women, the hips, spine, and wrists are the most common sites of fracture. Early detection of low bone mass (osteopenia) or osteoporosis is the most important step for prevention and treatment. Even after osteopenia or osteoporosis has occurred, actions can be taken to stop the progression of bone loss. Remember, effective treatment or prevention cannot take place if a man does not know he has osteoporosis or is at risk. The only way to accurately test the strength and solidness of the bones is with bone mineral density tests also called DEXA scan, which are performed like X-rays and measure the solidness and mass (bone density) of bones. National Osteoporosis Foundation recommends BMD testing for men over age 70, men aged 50-69 with risk factors, X-rays showing fractures or bone loss, fractures over the age of 50, height loss of more than ½ inch in one year or 1 ½ inch from original height. The doctor will take a medical history, asking questions to identify risk factors. The doctor should conduct a complete physical exam, including measuring height and weight, obtaining X-rays, and testing urine and blood. Inform the doctor at once if a loss of height, change in posture, or sudden back pain is noticed because this can indicate a fracture of the spine (vertebral fracture). Building strong bones and reaching peak bone density (maximum strength and solidness), especially before the age of 30, can be the best defense against developing osteoporosis. Also, a healthy lifestyle can keep bones strong, especially for people older than 30 years of age. Medical research on osteoporosis in men is limited. However, experts agree that all people should take the following steps to preserve bone health. Any underlying medical conditions that affect bone health should be recognized and treated. Also, use of medications that are known to cause bone loss should be identified and monitored. Treatments with medications to prevent osteoporosis can be considered in such patients. Change unhealthy habits, such as smoking and alcohol. Begin an exercise program. Ensure a daily calcium intake of 1,000 mg/day to age 50 and 1,200 mg/day for people 51 and older. Ensure adequate vitamin D intake. Vitamin D comes from two sources. It is made in the skin through direct exposure to sunlight, and it comes from the diet. Many people get enough vitamin D naturally. It is also found in fortified dairy products, egg yolks, saltwater fish, and liver. Vitamin D production decreases in older people, in people who are housebound, and during the winter. These people may need vitamin D supplements to ensure a daily intake of 400-800 IU of vitamin D.
Exercise is important to prevent osteoporosis. Although bones may seem like hard and lifeless structures, bones are more like muscle; bones are living tissue that responds to exercise by becoming stronger. Physical activity during childhood and adolescence increases bone density and strength, which means that children who get exercise are more likely to reach their peak bone density (maximum strength and solidness). People who reach their peak bone density, which usually occurs by 30 years of age, are less likely to develop osteoporosis. The best exercise to prevent osteoporosis is weight-bearing exercise that works against gravity. Exercises include walking, hiking, jogging, climbing stairs, playing tennis, and dancing. The second type of exercise is resistance exercise. Resistance exercises include activities that use muscle strength to build muscle mass and strengthen bone. These activities include weight lifting, such as using free weights and weight machines found at gyms and health clubs. Exercise has additional benefits in older people as well because exercising increases muscle strength, coordination, and balance and leads to better overall health. Elderly people, people with osteoporosis, and people who have not exercised for most of their adulthood should check with their health care professional before beginning any exercise program. Once a diagnosis of osteoporosis or osteopenia is determined, the doctor may talk about medications available to treat bone loss. The goal of treatment is to prevent the development of osteoporosis (if decreased bone mass or other risk factors are present) and to prevent further bone loss (especially if osteoporosis has already been diagnosed). The bottom line is to preserve the bone mass and density present to decrease the risk of fractures, disability, and mortality. The many treatments available today have been shown to work quickly (within one year), and they reduce the risk of fracture. The choice of treatment should fit a person's specific medical needs and lifestyle, so talking to the doctor is important. Alendronate (Fosamax) and risedronate (Actonel) are approved for treatment of osteoporosis in men as well as for steroid-induced osteoporosis. Zoledronic acid (Reclast) IV is also approved to treat osteoporosis in men. Teriparatide (Forteo) SQ contains a portion of the parathyroid hormone (PTH) molecule and has been shown to increase bone density of the spine in men. It is administered as a daily injection that is approved for men with hypogonadal (low testosterone) osteoporosis. Although many medications are prescribed to treat osteoporosis in women, currently they are not approved by the Food and Drug Administration (FDA) for use in men, but investigational studies in men are in progress. To help men with osteoporosis and low testosterone, doctors may recommend testosterone replacement therapy. In men, testosterone results in a small but significant increase in bone density. Calcitonin is another medication that slows or stops bone loss and may relieve the pain of fractures in some patients. Calcitonin is approved by the FDA for the treatment of osteoporosis in postmenopausal women. It has not been studied in men, but evidence suggests that it may work the same in men as in women. Calcitonin is available as an injection and as a nasal spray. The image on the left shows decreased bone density in osteoporosis. The image on the right shows normal bone density. Click to view larger image. 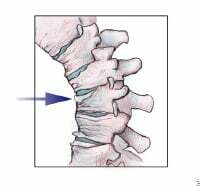 Arrow indicates vertebral fractures. Click to view larger image. Normal spine, B. Moderately osteoporotic spine, C. Severely osteoporotic spine. Click to view larger image. "Treatment of osteoporosis in men"
"Clinical manifestations, diagnosis, and evaluation of osteoporosis in men"
"Epidemiology and etiology of osteoporosis in men"
Are you a man with osteoporosis? Please tell us your experience.